At Restaurant Urwaldblick you can enjoy international and seasonal inspired dishes under palm trees. Take a seat on our indoor terrace and let your eyes wander over the tropical landscape or rest in the modern ambience of the restaurant. Either a romantic dinner for two, a healthy business lunch or larger get-togethers – at Biosphere Potsdam you can also enjoy delicious food. Our kitchen is characterised by fresh and regional products, seasonal matching and tropical influences. Asiatic, Arabic and French components in oriental tajine, veggie-burger or rustic meat dishes with an exotic flavour will delight your day. 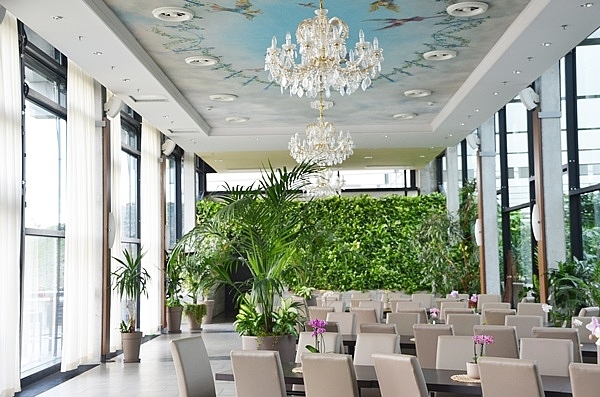 Birds‘ twittering, rushing waterfall and the gentle waves of the palm trees come with your culinary excursion on the indoor terrace of Restaurant Urwaldblick at the Biosphere Potsdam. Complement your visit with a tour through the tropical garden and extend your holiday feeling with a journey past the waterfall, along tortuous paths to the butterfly house to the high trail up in the treetops with a view over the tropical rainforest of Biosphere Potsdam. The restaurant is located on the second level and offers a perfect view over the tropical garden. The interior is characterized by a classic style with ceiling paintings and imposing chandeliers. The restaurant has an outdoor and indoor terrace as well as an air-conditioned interior. On 1st December 2017 we are open daily from 11am to 3pm. For short-term changes in the opening hours of Restaurant Urwaldblick please check the German website. Beginning on 1st December 2017 guests without day tickets for the Biosphere Potsdam are also very welcome to eat at Restaurant Urwaldblick.